In a similar vein to 10 currencies the NZD has risen against, here are 10 major currencies the New Zealand dollar has fallen in value against over the past 12 months. Over 2015, the New Zealand dollar (NZD) had quite the fall against the greenback – pushed down by a combination of lower dairy prices and improving economic conditions in the US. That fall also led to NZD drops against most other major currencies, but not all of them – as we pointed out in 10 currencies the NZD has risen against. Out of the most-traded currencies, here are the top 10 the NZD fell the most against over 2015 (from 1st of January 2015 to 1st of January 2016). The Hong Kong Dollar maintains a peg with the US Dollar (USD), and for that reason the NZD fell against it in a similar fashion to its fall against the USD. Over 2015, the NZD fell 12.33% from 6.05 to 5.3 Hong Kong dollars. 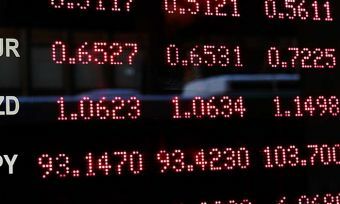 Against the world’s most traded currency, the NZD fell 12.31% from $0.78 to $0.68 USD. This fall set the standard for the NZD’s movement against many other major currencies. Contributing factors to the drop included the fall in the price of dairy – New Zealand’s biggest export, four 0.25% RBNZ rate cuts and the first US interest rate rise in almost a decade. Saudi Arabia has maintained a peg of its currency, the Riyal, to the USD since 1986. This peg has been hurting the country recently due to the low price of oil – their biggest export. The NZD fell 12.29% from 2.93 to 2.57 riyals. Israel is fast becoming known as a world leader in tech innovation and as such they are predicted to be one of the fastest growing developed countries. Their Shekel had a strong year on the back of this economic optimism, along with the country’s record balance of payments surplus. The NZD fell 12.22% from 3.04 to 2.67 shekels. The Yen is the third most traded currency in the world after the USD and the Euro. In 2015, the NZD fell 11.83% against it from 93.36 to 82.31 yen. The so-called ‘safe haven currency’, the Swiss Franc is the sixth most traded currency in the world. In 2015 the NZD fell 11.82% against it from 0.78 to 0.68 francs. Much of this drop took place in January, after the Swiss central bank suddenly abandoned its currency ceiling with the Euro – sending the franc soaring. Against the New Taiwan Dollar, which replaced the Old Taiwan Dollar in 1949, the NZD fell 11.10% in 2015, dropping from 24.67 to 21.93 new Taiwan dollars. Against the Pakistani Rupee in 2015, the NZD fell 9.77% from 78.52 to 70.85 rupees. The Philippine Peso has itself fallen quite significantly over 2015 against the USD. However, the NZD fell faster, resulting in an 8.28% decrease in value against the Philippine currency from 34.84 to 31.96 pesos.